In Brief: After a tough hill climb of 40–50 minutes, we reach a beautiful, unrestored stretch of Great Wall. The hike continues along the wall, passing through towers, finishing in a rustic village. Clouds over the Great Wall Spur. 3–4 hours start to finish over 7.5km. Note: tough climb at the start of the hike. While rated a 3+, this hike is sort of a tough 3+ because of the long climb at the beginning. We go up about 500m over 2km of trail, which is a climb worthy of a Level 4 hike. 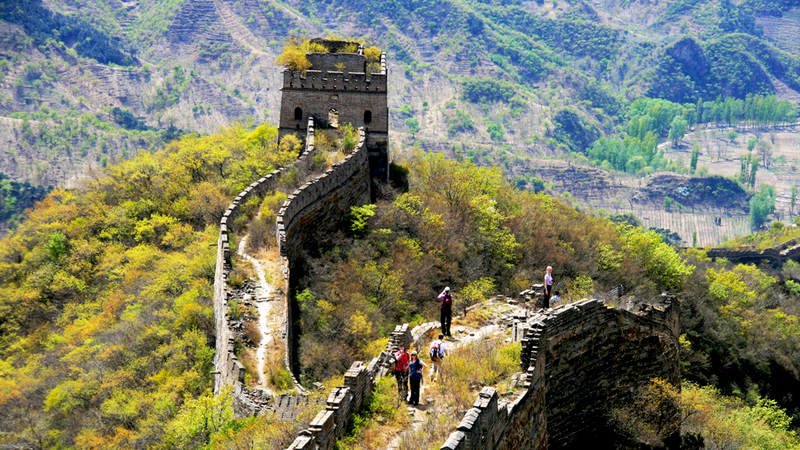 On this hike we will visit a section of the Great Wall that was completed around 1580 A.D., during the reign of the Ming Dynasty Emperor Wan Li. The hike begins with a warmup walk up a valley road, followed by a fairly tough climb up a hillside path to reach the Great Wall. This climb is steep in a few places, and it will take us 50-60 minutes. This is the most difficult part of the hike: approximately 2km, with a change in elevation of approximately 500m. After reaching the top we’ll follow the Great Wall as it winds along and up a ridge. Because the Great Wall was designed as a defensive fortification we will get excellent views, with mountains, villages, and other stretches of the Great Wall all in sight as we walk. We will pass through towers along the way, and stop for a snack break at the highest point. Our walk on the Wall will finish at a big tower – from there we’ll follow a trail down another valley, finally arriving at the small village where we’ll finish the walk. On a clear day we’ll have great views of the Great Wall to the northeast and west as we walk. The climb up to the wall is a long one – no problem if you’re into exercise! See 16 photos from a hike down the Great Wall Spur. We saw superb colours on this hike at the Great Wall Spur—see 13 photos of autumn views at the Great Wall. 22 photos from a hike along the Great Wall Spur, with the autumn colours just starting to show around the wall. We had near-perfect weather for this hike on the Great Wall Spur—see 12 photos. See a set of 21 photos from a hike up and over the Great Wall Spur, a line of unrepaired Ming Dynasty-era Great Wall. See a set of twenty photos from a hike up and over the Great Wall Spur, a line of unrepaired Ming Dynasty-era Great Wall. We hiked the Great Wall Spur on Singles Day—see 25 photos. See 15 photos from a hike along the Great Wall Spur. We had perfectly blue skies and long views on this hike along the Great Wall Spur—see a set of 18 photos. Photos from a hike to the Great Wall Spur on a hot and clear day. Photos from a hike up along the Great Wall Spur on a beautiful blue sky day. We did a lot of hiking during the big October holiday, and enjoyed excellent weather. 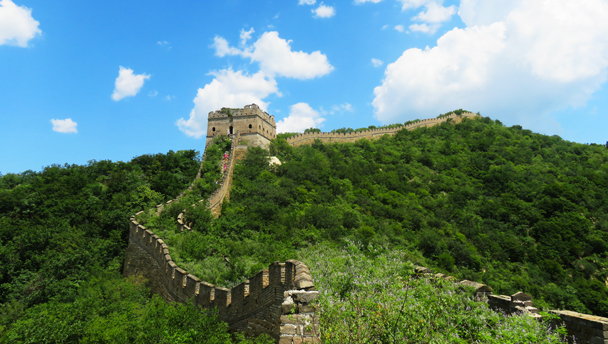 Click through to see some photos from our Great Wall Spur hike! One of our first hikes in May 2012 was the Great Wall Spur, an picturesque stretch of unrestored Great Wall in Huairou District. Click through to see the photos! The Great Wall Spur is a fantastic hike at any time of year. It was especially nice in the snow, which turned the surrounding peaks and valleys into a magical winter wonderland. Click through to see photos of the Great Wall covered in snow! This popular hike is part of our Seasons Series; we’ve done it in the spring and summer, and will repeat it in the autumn and winter. 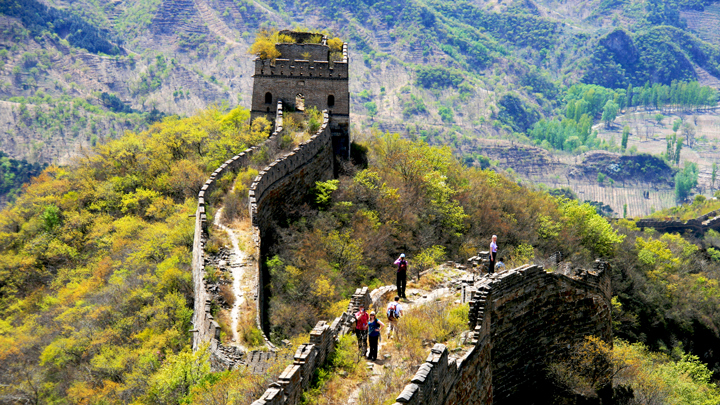 The Great Wall Spur is named for a section that branches off and ends at a cliff face. One story goes that it was built by mistake! After a challenging climb up a hill slope, we hiked along the Great Wall as it followed the top of a ridgeline, through several towers, before finishing at one of our favorite local restaurants. Click through for photos and more! This popular hike is part of our Seasons Series; we’ll be doing it again in the spring, summer, and autumn. The Great Wall Spur is named for a section that branches off and ends at a cliff face. One story goes that it was built by mistake! After a challenging climb up a hill slope, we hiked along the Great Wall as it followed the top of a ridgeline, through several towers, before finishing at one of our favorite local restaurants. On this visit to the Great Wall Spur we enjoyed clear and cool weather, and got a few good shots of the Great Wall - click through for a look. On November 15th we headed up to the Great Wall Spur for what worked out as a very nice hike - clear skies, a little bit of snow on the ground, some good climbing exercise, and a very tasty meal afterwards. Click through to see photos from the trip.